It’s not often a quarterback’s first NFL start is near-perfect. That was the case for 49ers quarterback Nick Mullens, who propelled San Francisco to a 34-3 victory over the Oakland Raiders Thursday night. Mullens completed 16 of 22 passes for 262 yards with three touchdowns in his NFL debut. He posted a 151.9 quarterback rating, which is nearly perfect. He led the 49ers to touchdown drives on their first two possessions, the first time they have done so all year. And he did not turn the ball over, arguably San Francisco’s most persistent shortcoming this season. So, why did it take so long to see Mullens? The second-year quarterback went undrafted last year. The 49ers signed him as an undrafted free agent and stashed him to the practice squad, where he remained for more than a season, until starter Jimmy Garoppolo suffered a season-ending knee injury in Week 3 of this year. With C.J. Beathard subsequently inheriting the starting responsibilities, Mullens was promoted to backup. Then, Beathard injured his right wrist last Sunday, which bothered him throughout this week. Mullens was given his first NFL start, and he aced it. 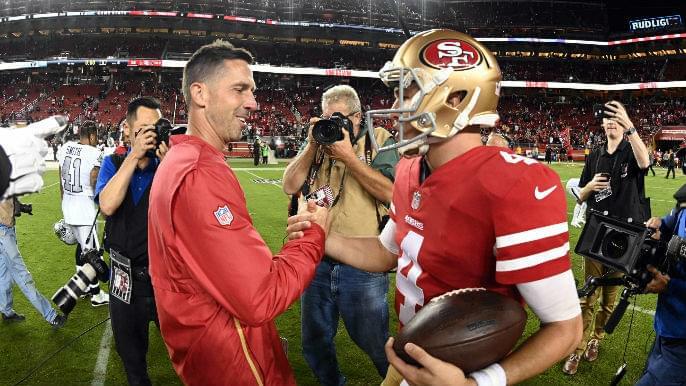 On Friday afternoon, during a press conference with Bay Area reporters, 49ers head coach Kyle Shanahan explained why Mullens was not drafted last year. Shanahan said it is rare for more than 10 quarterbacks to be selected in one draft. If they are not considered an immediate starter or backup, they likely will go undrafted. “Nick is not the tallest guy; he is not the biggest guy,” Shanahan said. “So, people are going to look to that stuff like you have seen guys from the past slide a little bit. He had a great college career, played in a spread offense, though, so you weren’t always seeing him under center and things like that. It was hard to envision how he would be. Mullens, standing at 6-foot-1, 210 pounds, broke Brett Favre’s passing and touchdowns records at Southern Mississippi. Mullens is quick to point out his offense ran more of a spread than Favre’s in college, however. Shanahan affirmed that. But the 49ers saw enough transferable skills in Mullens to sign him. They had their eye on him prior to the draft and hoped he would not be selected. “The type of guy he was, the way he did play in his offense, we knew he was a good football player,” Shanahan said. Shanahan has not yet determined whether he will start Mullens over Beathard in Week 10. The 49ers have 11 days off before taking on the New York Giants on Monday Night Football.